…to quote Mr. Presley. And at the risk of mixing metaphors, looking at your work through others’ eyes is critical to the long-term success of all managers. Stakeholder analysis is a great tool to ensure a comprehensive review of those with a stake (e.g, why they care) in those things ranging from the the simple to the complex. If you have a letter to send, a decision to make, a project to run, a policy to develop, etc., you should be considering the perspective of all who have a stake in it. They could be external to your organization (e.g., customers, suppliers, industry analysts, competitors, etc.) and internal (e.g., peers, superiors, direct reports, employees, executives, etc.). Not only should you consider their perspective, you need to consider the role you would like them to play and the value the stakeholder can contribute. For example, Do you want their feedback? or, Do you want to to influence their behavior? (or both!). Certain stakeholders will be perfectly served by simple, single communication, while others will require multiple personal contacts. To steal some thinking from the marketers… What are the needs and preferences of your stakeholders? Look for ways to group those with similar-enough needs and preferences. Consider grouping and acting by needs (e.g., provide feedback) and sub-grouping by preferences (e.g., personal telephone call). Marketers do this all the time- they just have a concept for it called segmentation. At the risk of getting too analytic (which you may want to do when managing more risk) there are a number of models and matrices to help you think through this. For example, I quickly checked Wikipedia and, while not part of the Wikipedia article, was reminded of a three-dimensional mental model (Venn diagram) I have found particularly useful over the years for stakeholder analysis: Political, Emotional and Rational. Other analysis can be conducted to group those with similar needs and preferences to ease your interaction. 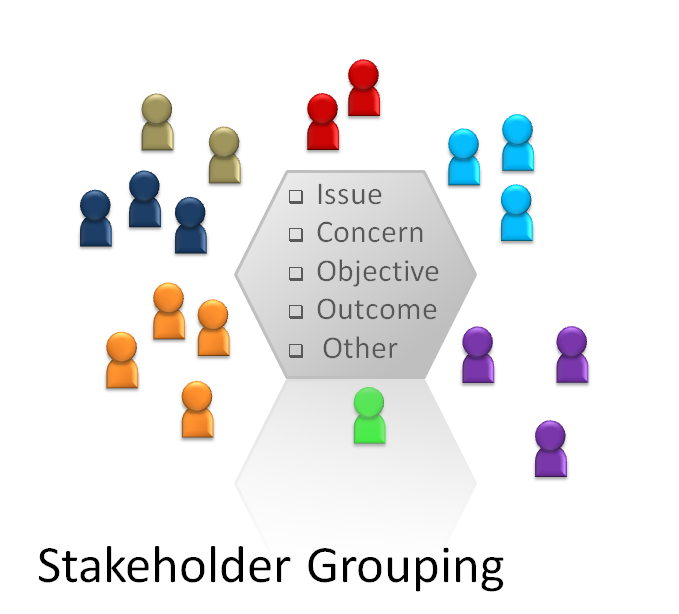 For example, collecting feedback can be accomplished early in a design project via group brainstorming. Subsequent rounds of review may be conducted via emails, wiki’s, conference calls, etc. leading to a survey of design alternatives among a much broader group. …it all depends. A few closing thoughts should help you think through how you might use this powerful, yet extremely simple tool. What are the possible consequences of including or not including a stakeholder or stakeholder group? 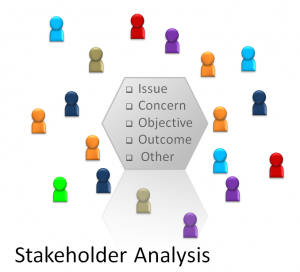 Is there a sponsor, executive or other learned soul who can help you think through your identification of stakeholders and development of a stakeholder plan? Typically, there are a few who should get special handling- individual phone calls or one-on-one’s versus email to key clients or suppliers, for example.